ARMOUR SQUARE — In the hallways outside the fancy suites at U.S. Cellular Field, workers wiped and polished the wood trim around the walls. Outside, grounds crews mowed the outfield grass and tamped down the infield dirt. Coolers were stacked with local craft beer and the smell of grilled sausage wafted in the air as smiling ballpark organist Lori Moreland banged out melodies of "Na Na Hey Hey Kiss Him Goodbye" and "Take Me Out to the Ballgame." 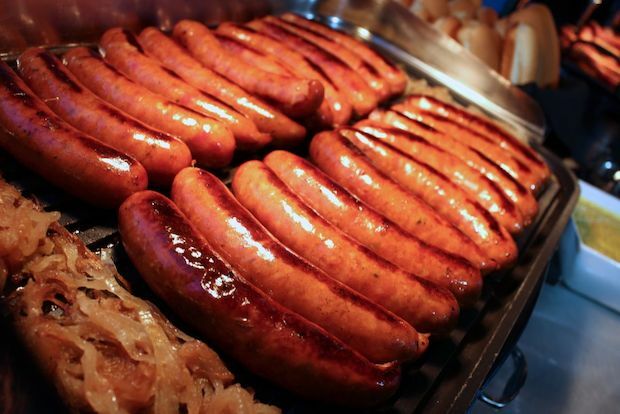 Hope springs eternal at The Cell, where White Sox team executives on Wednesday announced menu and beer upgrades along new stadium features for the upcoming baseball season, which begins Monday. The new beers offered at the South Side ballpark include Logan Square's Revolution Brewing (Anti-Hero India Pale Ale), the soon-to-be-open-in-Lawndale Lagunitas Brewery (IPA, Lagunitas Day Time Pale Ale), Bowmanville's Half Acre (Daisy Cutter Pale Ale), Michigan's Bell's Brewery (Oberon Ale) and a few more. Weighing in at a belly-busting 3 pounds, the sundae is served in a plastic replica helmet, complete with four scoops of vanilla, chocolate and strawberry ice cream and topped caramel, strawberry and chocolate sauces and whipped cream and cherries. Also new to the beer lineup are MillerCoors' Smith and Forge Hard Cider, Miller Fortune and Veteran Beer's Company Blonde Bomber Ale. The team also announced new food items, including a roster of gourmet sandwiches that includes a Chicago-style pork chop sandwich, an adobo mango chicken sausage sandwich, a burger topped with creamy bacon mac and cheese, and a chicken and waffle sandwich, available only in the club level, diamond suites or "stadium club experience" sections. Two of the stadium's "Burger Barn" locations at sections 112 and 528 will sell "Bacon-on-a-Stick" treats described as "thick cut, premium Danish bacon seasoned with black pepper" and served on a stick. Asked if peanuts-and-Cracker Jack purists might reject the gourmet upgrades, Joe Nigro, a manager of SportService, which supplies ballpark concessions, was quick to respond. "Absolutely not," he said. "We've got salads and gluten-free options, too. We're capturing everyone we can." The team also showed off its new Xfinity Zone bar in section 107, where patrons can charge their mobile phones and tablets while munching on corned beef and turkey club sandwiches. At the "K Zone For Sale" in section 154, fans can present gameday tickets in exchange for Chris Sale T-shirts and "K-Card" strikeout souvenirs when the Sox ace is on the mound. If all of the beer and snacks and sandwiches don't fill fans up, perhaps the Banana Split Sundae Helmet will. 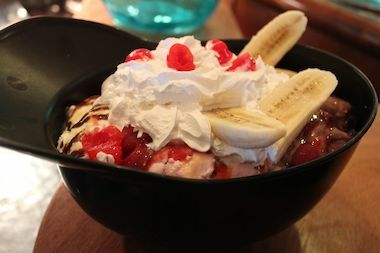 Weighing in at a belly-busting three pounds, the sundae is served in a plastic replica helmet, complete with four scoops of vanilla, chocolate and strawberry ice cream and topped with caramel, strawberry and chocolate sauces and whipped cream and cherries. Outside the ballpark, longtime Sox fan Dan Nemeth, of Elmhurst, visited a ticket window and picked up seven tickets and parking pass for Monday's home opener. "I've been a fan since day one," he said. "You keep your loyalties." Opening Day tickets are still available by visiting the team's official website, visiting the stadium ticket office or calling 866-SOX-GAME.